Palmills is a Sticky listing project with investment plans that will pay you returns for 60 days. I reinvested into this project $360 and added it to DavidNews.com HYIP monitor on 16th of November. This company comes with way different legend than others and this time we are talking about palm oil that is part of many consumer products. I'm sure that will be no secret for you that palm oil is part of most of the products that taste sweet. 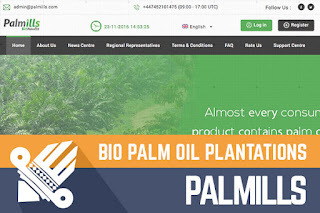 In general, it is a huge industry, but not that many people know that palm oil is dangerous for your health, but that is a topic for different blogs, so, this time I will not talk about that. In general, Palmills is quite simple, but at the same time with information packed project. The project offers one, but very easy investment plan. Basically, for 60 business days, you will receive 3.5% daily return, and your initial deposit will be included in the payments. Talking about investing it is important to note that also withdrawals are carried out instantly, and you just need to request your withdrawal and money will arrive at your e-currency account balance. The project has simple member area, but those who likes to read can check all the pages because as I said - there are a lot of textual content. Those who are not interested in reading can view video how Palmills operates, but I advise you to be skeptical since Palmills is still an HYIP and is not that different from others. I hope that Palmills will prove that it is different and I believe the best way how to show that is a lifetime. If this project survives quiet December and January, I think it could be very successful one in 2017, but before investing calculate your risk carefully. In the end, I just want to remind that if you spend than only that you can afford to lose. Investment plans: 3.5% daily for 60 business days, initial deposit included in the payments.